At this year's Coachella Music and Arts Festival, Lil B announced he would name one of his future albums "I'm Gay." (CNN) -- Brandon "Lil B" McCartney is no stranger to making bold statements. In front of thousands of concert-goers at April's Coachella Music and Arts Festival, the 21-year-old rap artist announced that he would name one of his future albums "I'm Gay." So, what's the big deal? Well, for starters, Lil B is not gay. And although it'd be easy to write him off as another performer trying to stir up controversy and gain popularity, he's already got the latter covered. 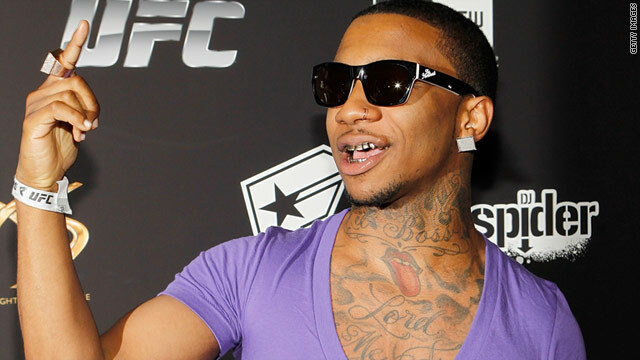 Like Soulja Boy and Justin Bieber, Lil B has almost single-handedly used the internet to put himself into the spotlight. In a few short years as a solo artist without a major-label deal, Lil B has recorded almost 4,000 songs, gained over 200,000 Twitter followers and signed a touring deal with LiveNation. His YouTube videos have been viewed 28.7 million times and counting. Lil B's supporters and fans laud him for his gender-defying self-proclamations that he's "pretty b----" and a "princess" while producing songs inspired by untraditional hip-hop topics like Miley Cyrus and Ellen DeGeneres. At the same time, a growing skepticism follows the artist, who some critics argue is full of himself and is more concerned with selling an image through hyperbolic claims than any music of substance. Lil B says he saw the Coachella moment as a chance to bridge the differences between communities and spread his message of "loving." "I think that (announcement) was so much bigger than he was," said Terrance Dean, a former MTV executive and the openly gay author of the book "Hiding in Hip-Hop." "That it was like seeing his future before it even actually happened." While advocates in the LGBT community like Dean feel that Lil B is sincere, others like Lloyd "Gyant" Dinwiddie, a BET blogger of the year who is openly gay, aren't so sure. "I don't want to take anything away from what I think he's trying to do," Gyant said of the album, which is set for release in a few months, according to Lil B. "I really do feel that it is less about social evolution, and it's more about making a name for yourself and selling your project." Lil B sat down with CNN to talk about the inspiration for the title, the death threats that have followed and why he's the rap version of Lady Gaga. The following is a transcript of that interview. CNN: What were you thinking when you named the album "I'm Gay?" Lil B: It was something that was going through my mind for a while. I feel like I'm man of the people: meeting people, respecting people and accepting people. I hope that I can turn some of my fans that might be homophobic or supporters that might be homophobic and say, "You know what, we're all one people. This is love." It's just respect, and I did that to bring people together and bring more love and to spark the minds of people and not let words and judgments and stereotypes stop you from loving. CNN: I read that you've gotten some death threats. Lil B: Mainly, a lot of them are on Twitter, saying that they're going to kill me for being gay, and they're going to kill me for being homosexual even though I'm not homosexual. I don't like men. They're saying they're going to bash my head in. They're calling me f-----. That's all right, because I did this with the pure intention in my heart to help people, and I didn't do this for promotional reasons. I did because there needs to be someone brave enough to do it, brave enough to speak up and have the right reasonings of doing it. CNN: What's your response to people who say this is all a gimmick? Lil B: I'm not here just doing stuff just trying to do it or outsmart somebody and try to do something witty. I call myself the human sacrifice, because I look at it like, no one else is going to do it and push that line for the people, and I'm going to do it, and they're going to look at me and say, "Well, you know what? If that guy can do it, I can be myself too, and if that rapper can be himself and be free and be happy and still hold masculinity and love people and love flowers and just be happy being alive, well then, I can do that too." CNN: You're big Twitter fan, and recently rapper Rhymefest tweeted that after he spoke to California artist Xzibit and listened to your music, his response was, "Homeboy needed a dad in his life." Lil B: I'm going to say, who is Rhymefest? So he needs to work on promoting and marketing himself, because I don't know him. But what I feel about his comment is that it's true, I needed a father figure in my life, but I'm not complaining about that. What do you mean, I need that? Tell Rhymefest I'm very happy. Tell Rhymefest I actually wake up and I'm happy, and I'm positive and I love people. Ask Rhymefest, does he feel the same way? CNN: How influential are your parents in your career, and what do they think about your music? Lil B: I can say they're not very influential in my career, but I'm motivated; I work hard to show my mother that her child has a purpose. My father has played a part unconsciously when I was younger, which he probably didn't know,. But he was giving me a lot of good music, (and) my mother played a lot of good music. So I will always forever show respect to both of them on that. They might not be listening to my music all the time because there's stuff that they don't agree with. I don't expect them to agree with my language and stuff like that. CNN: You've called yourself rap's Lady Gaga. Care to elaborate? Lil B: It's just because I'm fearless. I have a huge support base of people that love me around the world: millions of fans and supporters and growing. You know what, it's just me putting what I want to put out and me just being an artist, a true artist to myself. I go to sleep happy. I wake up excited because I give the truth. CNN: On Twitter, you threatened to sexually assault Kanye West if he didn't respond to your tweets. Why threaten Kanye West with sexual violence? Lil B: You know, really, it's just my jokes. I have a funny sense of humor. If I was a comedian and I was up on stage, people would think that's funny, because I'm a funny comedian. I'm an entertainer. Throughout the years I feel if God promotes me to stay alive and have more years to live on Earth, which I pray and I would love to, people are going to see my personality, and they're going to see more of me and be able to understand me more. CNN: Do you think of a lot of the hate/confusion is a generational thing? Lil B: There's a disconnect because they want a disconnect. When you want to read the book, come read the book. When you want to come talk to me and be my friend, come talk to me. They want that disconnect. They want to seclude themselves. The generation gap, they don't want to understand. CNN: What's your response to folks who say you've pushed the progression of hip-hop back a few steps? Lil B: They're just not paying attention fully, and I forgive them. Not everybody has time to pay attention fully, or not everybody has the time to read a book. Some people refuse to read books, and I'm just an unread book. Open me!